How many sharks live at Shark Reef Aquarium? 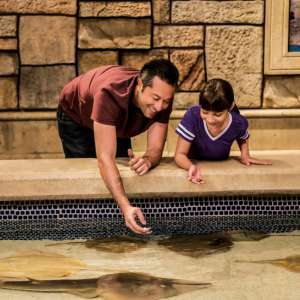 There are over 2,000 animals that live at Shark Reef Aquarium, including 15 species of sharks. Do sharks give birth to live young or lay eggs? Some sharks, like the Bamboo Shark, are Oviparous, which means they lay eggs. They usually take about 2 to 3 months to hatch. Other sharks, like the Sandbar Shark, are Viviparous, giving birth to live pups. They are usually born after 9 to 12 months. How long do sharks live? It is estimated that sharks can live as long as 40 - 60 years but no one knows for sure. There are no known ways to determine the age of a shark since the shark has no bones in its body, only cartilage. The New York Aquarium had a sandtiger that lived there for 43 years! Shark Reef Aquarium has a nurse shark that has been in aquariums for over 30 years! How big do sharks get? That depends upon the species. The dwarf lantern shark gets as large as 7 inches. The whale shark gets as big as 60 feet! Great whites average around 18 feet for an adult but can get to be over 20 feet. Sandbar sharks get up to 8 feet. Shark Reef Aquarium's largest shark is the Sandtiger, which is almost 9 feet in length. How many teeth do sharks have? Most sharks have as many as 300 to 500 teeth. Some sharks can have more than 3,000 teeth but these teeth are usually small in comparison to the shark's size. They will loose and replace their teeth their entire lives. Why do some of the sharks lay on the bottom and others don’t? A common myth about sharks is that they all must swim in order to breathe. While that is true of some sharks, the majority of sharks, like the nurse shark, can rest on the bottom without moving, using muscles to pump the water over their gills to breathe. Why don’t the sharks eat the other fish? Though sharks are viewed as eating machines constantly in search of food, this is definitely not the truth. Our large sharks in the shipwreck exhibit are fed three times a week. Each shark is fed individually so our aquarists insure that the dietary needs of each animal are met. Sharks are also opportunistic hunters. They tend to feed on prey that is weak, sick or injured. Because our sharks are fed a healthy diet, and the fish that reside with them are healthy, the sharks do not need to expend the energy to chase their co-inhabitants for food. What and how much do the big sharks eat? In an average week we will feed over 360 pounds of fish, including mackerel, capelin, sardines, and squid. That's a total of nearly 19,000 pounds of fish per year! How do you prepare the fish for the sharks? The feeding protocols are carefully determined by the animal care staff and the food selected is designed to mimic their natural diet. All food is previously frozen and is weighed, measured, and prepared fresh daily by our Dietary Aquarist. We serve high quality seafood from many of the same purveyors that supply seafood to your favorite Las Vegas restaurants and follow the Seafood Watch Guidelines. Have any of the big sharks ever bitten anyone? No, but for added protection we wear a chain mail suit which is made of stainless steel mesh that helps deter the sharks from interacting with the divers and provides protection if there ever was contact. It can weigh from 15 to 22 pounds depending on the size and costs over $4,500. What do the jellyfish eat? We will hatch live Brine Shrimp (or Sea Monkeys) daily. They are fed twice a day because in the wild they are filter feeders, meaning they will ride the currents and eat anything they pass that is small enough for them to digest. What do the piranhas eat? The piranhas eat a variety of fish, chicken, live goldfish, and frozen rodents. They eat 3 times a week. Unlike nature programs that show them devouring an animal in a matter of seconds, our piranhas are surprisingly calm when they are fed. Because our piranhas are so well fed, they have no need to eat as if it were their last meal. Why do some of the fish seem to be going to the surface for air? Fish like the arrowana and arapaima (both found in the Amazon River) actually have modified lungs and can be seen taking a breath about every 2 to 3 minutes. The sandtiger sharks will also gulp air from time to time, which helps them control their buoyancy. Why don’t the stingrays in the touch pool sting people? Because the barbs on the stingrays are similar to our fingernails, we can clip them periodically to ensure it is safe for the public to touch the animals. The barbs will grow back, so we have to make sure to clip them regularly. Do you have any poisonous animals that live at Shark Reef Aquarium? No, but the lionfish and jellyfish are an example of venomous animals. Venomous animals have an active delivery system and may use their toxin for protection or to help them catch food. Unlike poisonous animals, venomous animals store their toxin in venom glands. They inject their toxin into their predator or prey using fangs, pinchers, spines, or any other sharp body part that can introduce venom. What do the reptiles eat? The crocodiles eat trout, herring, sardines, rats, and chicken. They are fed twice a week. They could go up to a year without eating in the wild. The monitor lizard also eats twice a week and is fed mainly trout, chicken or rats. What is the difference between a crocodile and an alligator? Alligators and crocodiles are both part of the scientific Order of Crocodillia; however there are some specific differences. Crocodile's snouts are a more pointed, "V" shape. When their mouth is closed both upper and lower teeth are visible. The snout of an alligator is more rounded and, when the mouth is closed, the teeth in the lower jaw are almost completely hidden. How long can a crocodile hold its breath? Crocodiles usually stay submerged underwater for only about 15-20 minutes, but they can remain submerged for up to 2 hours. How big will Shark Reef Aquarium’s crocodiles get? Crocodiles continue growing their entire lives. Depending on the species, they can reach lengths between 5 feet and 23 feet. They can weigh between 600 pounds and 2000 pounds. Our largest crocodile is about 10 feet long and weighs close to 200 pounds. How does Shark Reef Aquarium get its salt water? Because we are in a desert we can't pump in salt water from the ocean. We must create salt water from scratch. First, we treat the Las Vegas city water to remove minerals and chlorine. We then add a synthetic salt product called Instant Ocean. You can buy Instant Ocean at your local pet shop for your home aquarium. At Shark Reef, we purchase Instant Ocean in 1 ton bags and we use nearly 200 tons per year. How do you filter the water for Shark Reef Aquarium? There are 3 steps to filtering our exhibit water. Mechanical filtration takes place with our sand filters. Sand filters remove suspended particles and debris from the water. These filters use 60 horse power pumps that can cycle 1.3 million gallons of water in 90 minutes. The pumps are so powerful they can drain and re-fill an average sized swimming pool in about 2 minutes. Biological filtration is accomplished with the help of Trickle Filters. These filters are filled with thousands of plastic balls with lots of surface area to allow living cultures of beneficial bacteria to convert toxic waste products from the animals to less toxic compounds. Chemical filtration takes place with Ozone (the same ozone in our atmosphere, but in a very controlled environment). Ozone is a highly reactive gas and an extremely powerful disinfectant. How are all the systems at Shark Reef Aquarium monitored? We have an automated computer system that monitors all the pumps, filters, water, and pH levels. We also have a person on our Life Support staff here 24 hours a day in case something goes wrong. In addition, the water in every system is sampled daily by our on-site Water Quality Lab Technician and results are posted for staff to evaluate the health of the animal systems. We have a back-up generator that will kick on within 5 seconds of a power interruption. Is the coral a Shark Reef Aquarium real? No, our coral is made from molds of real coral skeletons and are actually polyurethane plastic. How did Shark Reef Aquarium acquire the animals in its collection? Many of the animals at Shark Reef Aquarium were acquired from other AZA facilities. 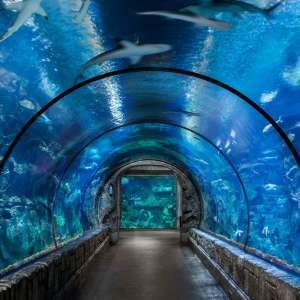 For example, Long Beach Aquarium and Shark Reef Aquarium support each other in stocking exhibits that provide for our primary mission of educating the public. Animals that are collected from the ocean are done so by reputable and responsible suppliers. This means that the animals are collected from healthy, sustainable populations, and are collected in ways that minimize impact on the environment. I would love to work in a zoo or aquarium. What do I need to do? The staff of Shark Reef Aquarium has varied backgrounds. All share a common love and respect for the animals under their care. One thing to keep in mind is that there are only 213 AZA accredited facilities, so there is a lot of competition for animal care employment. To be the best qualified candidate, we recommend getting a college degree, and depending on what your interests are, studying any of the following-biology, zoology, chemistry, psychology, education, or engineering. We also suggest applying for internships or volunteering at a local museum, veterinary office, or other related facility. Any relevant experience where you can acquire valuable, job-related skills will help you in your goal of pursuing a career in the zoo and aquarium field. Do you have any endangered species that live at Shark Reef Aquarium? We have 3 Green Sea Turtles and 3 Green Sawfish which are endangered species. Our newest resident, the Komodo Dragon, is also endangered. The Sandtiger shark is considered a Threatened Species. Purchase your tickets to Shark Reef Aquarium now. Get closer to the marine life with special events and unique experiences at Shark Reef Aquarium.